Bruce Bennett, Managing Director, bought a small, struggling workshop in the eastern suburbs of Melbourne from his father Ron, relocated to Blackburn and built the new business from scratch. Bruce Bennett, Managing Director, bought a small, struggling workshop in the eastern suburbs of Melbourne from his father Ron, relocated to Blackburn and built the new business from scratch. I look forward to the repair process going well and producing quality workmanship. I still believe there are only three components of business: service, quality and price - with price being the only negotiable factor. I like seeing the younger generation coming through and I make sure we have the best and healthiest environment for our staff to work in. Looking back, it all started when I was quite young, selling petrol at the local service stations in Blackburn and delivering and selling newspapers. As I got older I started to take on other tasks part-time, including manning the phone for RACV call-outs at my father’s business when vehicles had broken down. On the weekends I used to work at the dog boarding kennels and I also went to the local state and high school in Blackburn. Just before I turned seventeen I bought a Bolwell Mk7 kit for around $1,500. I purchased the running gear (such as the engine, gearbox, front and rear end) from a written-off XT HR Holden (1965/66 model), and transferred it all into the Bolwell. About three years later, although it was incomplete, I sold it for around $4,500. By the time I was eighteen, I was driving tow trucks and an RACV service van, and doing mechanical repairs. Back then I was actually working three to four jobs simultaneously, such as working at Glenville Display Homes in Hartwell as a purchasing officer. Just prior to that, for a short time I worked as a lab assistant at David Bull Laboratories in Canterbury. During this period when in between jobs I tried roofing, plastering and other labouring work to top it off! The most profitable small business, however, was selling vehicles wholesale to small caryards in the eastern suburbs of Melbourne. This small business at one stage was moving up to ten vehicles per week on a $50 margin per vehicle. In today’s figures that would be a minimum of $500 - $1000. It was great money back then. Even at a young age, I learnt the value of providing a good deal and realised that small margins and high turnover could be very profitable. I had enough money to buy my first house at twenty-one, but instead invested it and went travelling around Australia. I bought my first house later at the age of twenty-four. My father Ron was a fitter and turner by trade, but had a Panel Beating business in Mitcham. He was an RACV towing contractor for RACV roadside service and would go out on vehicle breakdowns. He also operated a small towing business. This was part of the reason why I learnt about servicing vehicles and the logistics of business at such a young age. My father was very good at a lot of things but flying was his passion and racing light aircraft, and because he was involved in so many races, he lost his focus and direction and ended up being declared bankrupt in 1972. In 1974 I lent my father money which was offset against taking over the Mitcham business in later years. I eventually bought the business off my father in 1977. To finalise the deal, I purchased a brand new Toyota Landcruiser 4WD for my father. All equipment salvaged from the Mitcham business was used to set up from scratch at a new location in Alfred Street Blackburn, as Blackburn Motor Body. We had one tow truck, an RACV service contract and just two staff plus myself. By 1983 we had 70 staff employed across numerous locations, as well as operating Blackburn Automotive Repairs. We also slowly built up Blackburn Towing - we gained another local towing licence and purchased Eastside Towing and Box Hill Towing. Blackburn Towing was by then a formidable smash towing service. Before allocation was introduced in late 1982, we were pulling in upwards of 250 accident tows per month. This ultimately underwrote the expansion of Blackburn Motor Body. We then purchased Munday Panels in Bayswater. Further up Blackburn Road in Doncaster we launched the Symes panel shop in 1987 and, interestingly, the nearest competitor was our own Blackburn Motor Body, some five kilometres away. Between that time and 1995 we purchased another five shops and then launched Benro Industries, our heavy commercial panel business, to deal with vehicles such as prime movers and buses. In the early to mid-1990s we branched out further to include project management, such as consulting across Australia to re-image (repair & repaint) the entire fleet of Nestlé vehicles, and re-imaging local government fleets during the era of council amalgamations. More recently, in Sydney we carried out a modification program on 300 buses that belonged to the NSW State Transit Authority. We bought an old factory in George Street, Blackburn, in 1994 and later developed the site into a state of the art facility behind our Railway Road premises. This is now our administration and vehicle delivery department. I have also enjoyed building partnerships over the years I have been in business, the most recent partnership being Collingwood Collision Repair Centre. I’ve been associated with some of my business partners for nearly 25 years. We are still a growing company with our most recent purchase being Browns Motors in Thornbury. Although we were growing both organically and by purchasing other businesses, in 1982, the government introduced the new “Accident Allocation System” that did not work for us. It meant that our allocation of accident damaged vehicles dropped to about 80 to 100 per month. We had to source new ways of getting business and find new ways to market our business. This was a period with some failures but many successes as we tried different ideas. Expanding our third part recovery which was was established in 1978 to assist our clients, for example, was a terrific success. The most significant effect of allocation in the towing industry was our desire to transform Blackburn Towing. The very fact that accident allocation was introduced forced us to re-think what we could do with Blackburn Towing. Between 1982 and 1986 we worked on expanding that part of the business from smash towing and RACV towing to a specialist transport company encompassing all aspects of towing. Eventually, we were fortunate to find new partners that had a common goal within the towing industry and that was to create the best towing service ever. In August 1987 with our new partners, we launched Nationwide Towing. From relatively humble beginnings with 12 vehicles and 20 staff, the business grew to include over 120 vehicles and 187 staff by the time we sold our 50% share some 20 years later. Nationwide Towing has continued to grow and is still recognised as the largest and best towing service in Australia. Today, our workshop in Blackburn is fully equipped with the latest technology and is considered to be world class, covering 78,000 square feet in land area. It is a state of the art workshop facility. We repair between 170 - 200 vehicles per month. Blackburn Motor Body is recognised by our peers as operating one of the most technically advanced collision repair facilities in the Southern Hemisphere. Our panel technicians have been extensively trained in the use of computer-controlled measuring systems. These systems are so accurate they can hold tolerances and clearances on a vehicle far better than the original factory build specifications. Air-Vac dustless sanding is utilised in all repair and preparation bays to eliminate dust in the air and onto customers' vehicles. 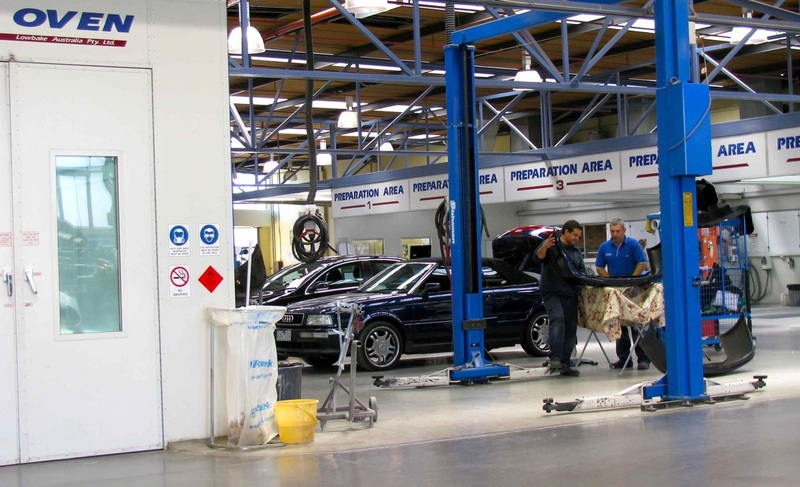 Our facilities meet and exceed all relevant EPA compliance regulations - and every known Australian Occupational Health and Safety standard (OH&S) for the collision repair industry. Blackburn Motor Body is an Authorised Contracted Collision Repairer for Audi, Lexus, Subaru and Nissan GTR. We also have agreements with Toyota and work on many other prestige brands such as Mercedes etc., and all other family vehicles. Your vehicle was primarily designed to carry passengers. If you have an automatic transmission, the transmission fluid will probably need to be changed more often. You should also inflate your vehicle’s tyres to the maximum pressures recommended in the owners manual and carry your own tyre pressure gauge. Uneven pressures can cause dangerous sway and the quality of your caravan tyres is crucial for safety. Education: Blackburn State School and Blackburn High School. My apprenticeship: Selling cars wholesale, roofing, plastering, selling homes and landscaping. Personal details: Married with three children, fourteen grandchildren. Interests: Golf, tennis, follows the AFL and the Essendon Football Club. Drives: 2009 Audi A8 quattro, long wheel base 4.2 litre engine. I like it for its sportiness, excellent finish and build quality. We still have two Lexus vehicles on our fleet including an LS 430, an IS300 and an Audi Cabriolet 3.2 litre. Prestige vehicles: All prestige vehicles are very good in build quality, they all have a different feel on the roads and performance enhancements. My dream car is a Bugatti Veyron. Vehicles previously owned: Over the last forty years, I have owned in excess of seventy different vehicles which include: Austin A30’s, FC and EH Holdens, Bolwell Nagari Mk7, Mini Cooper ‘S’, Toyota Landcruiser, Porsche 911’s, Jaguars, BMW’s including 530 and 750 models, Lexus’s including LS 400, LS430, and IS300, Bathurst Monaro, Ford GT, 1980 Mercedes Benz 450 SLC and an Audi Cabriolet A4 6 cylinder. Employs: Over 100 staff and the business has been operating at the Blackburn location for over thirty years. Specialist approved repairer includes: Audi, Lexus, Nissan GTR, Mercedes Benz and Subaru. Future direction: To continue to be the leader in this industry, grow the brands with whom we have contracts, and expand our overall businesses. Note: I met Bruce Bennett at Blackburn Motor Body and completed the interview in 2010. Head Office Address: 88-90 Railway Road and 1-9 George Street Blackburn, Victoria.